Change is hard for many people. Bands form, albums get released, fans fall in love with a sound and then someone decides they want or need to make a change. Backlash ensues, people get nervous but the world keeps turning. Still, there’s no denying that all too familiar scenario wherein something or someone we as a consumer public have grown attached to, announces a major shift and an inevitable sprinkling of mild panic rains down. This is how at least a portion of artists and fans might be feeling (present company included) over the announcement this morning from direct-to-fan e-commerce company, PledgeMusic, about the imminent acquisitions of Austin based live recording start-up, Set.fm and London-based music distribution platform, NoiseTrade. These three companies combining their artist and fan oriented focuses is both exciting and somewhat terrifying. The latter is mostly because despite their similarities, each feels like a very unique company that each fill a specific need and or factor of convenience in the music industry and the thought of them simply cramming together under one house roof has to makes on wonder if some of those individual appeals might be lost. Conversely, there’s a difference between things that complement each other well and things that shouldn’t be mixed or, perhaps don’t do as well when mixed together. (Just think of three foods that make for a perfect three course dinner, instead turned into a pile of food on a plate.) These things said, it would be rash to already firmly presume this move a negative one. Presently, the leaders of all three companies are concentrating on how each of their brands’ skill sets will best fit in a unified amalgamation and it is hard to argue with the kind of logic offered by PledgeMusic Founder/CEO, Benji Rogers, who sees the big picture of this blend where the “lifecycle” of new music is concerned. Until more details of PledgeMusic’s restructuring come into the light, artists and fans alike will simply have to wait it out and keep a positive outlook on the adaptations yet to come. Theoretically, if the companies bring their resources together in just the right way, there might just be a new one-stop artist-to-fan juggernaut on the music industry block. 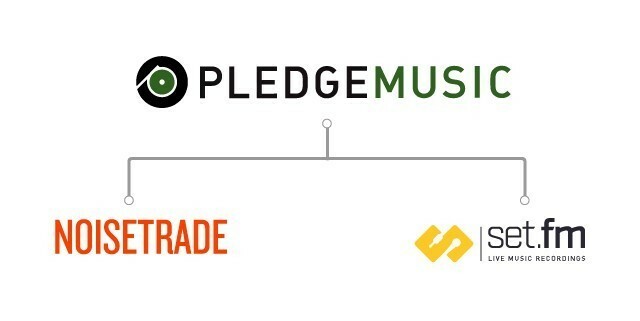 Get to know more of what NoiseTrade, Set.fm, and PledgeMusic bring to the table before they transform into the next major music and tech hybrid and read Rogers’ thoughts on the merger in this letter posted to PledgeMusic’s website.